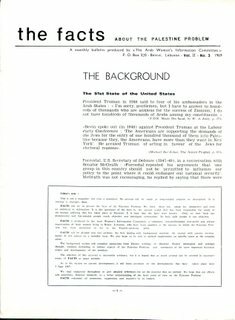 The Facts about the Palestine Problem was a series of pamphlets produced from 1968 until, at least, 1970. 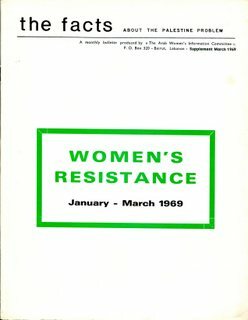 They were published by The Arab Women’s Information Committee based in Beirut, Lebanon. Financial constraints effected regularity of the, planned, monthly bulletin – a problem that the Palestinian cause has always had to face, even when ‘supported’ by some of the most wealthy nations on the planet. 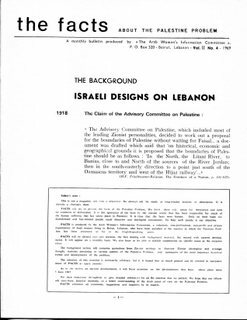 The stated aim of the editors was to produce a factual background to the situation in Palestine following the disastrous war of June 1967 (known as the Harb – The Setback – in Arabic) which saw the annexation of huge tracks of Palestine by the Israeli Zionists. 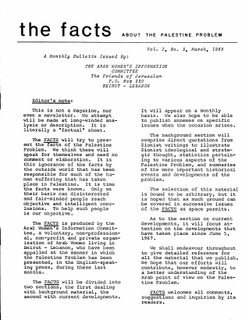 At the time of the 1967 ‘Six Day War’ pro-Zionist propaganda was riding high in the capitalist ‘west’ with the idea being promoted that Israel was the innocent victim of an anti-Semitic plot of genocide. 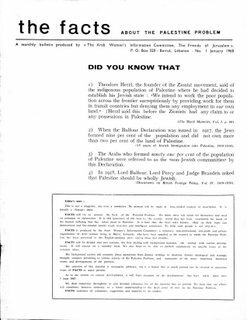 These bulletins were part of the propaganda fight back to put the case of the Palestinian people. Events in the now almost 50 years since that war the world has witnessed countless examples of the attempted genocide (now re-branded as ‘ethnic cleansing’) of the Palestinian population by the increasingly Fascistic Zionist State of Israel. 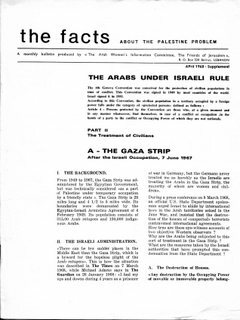 Notwithstanding the time that has passed since The Facts about the Palestine Problem were first published they still contain many facts and details that many people don’t know about, realise or understand. It is hoped they may be useful in reminding people of what is happening in that part of the world by providing an historical background. The attitude of the United States of American to the migration of American Jews to Palestine, especially in the time just before the formal declaration of the State of Israel on 15th May 1948. 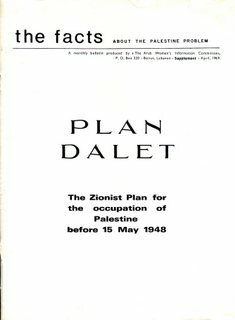 The Zionist Plan for the occupation of Palestine before 15 May 1948. 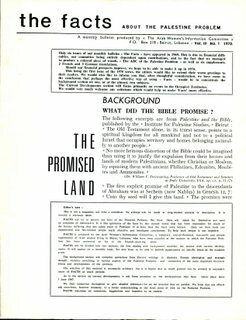 The Zionists claims that the existence of the State of Israel on the land of the Palestinians lay in what was written in the Christian Bible. 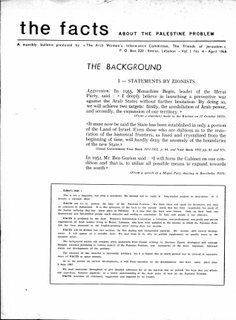 The Zionist plan for the expansion of the State of Israel to cover all the territory between the rivers Nile and Euphrates, demonstrated by a series of maps and accompanying statements. The treatment of civilians in the Gaza Strip under Israeli Occupation after 7th June 1967. 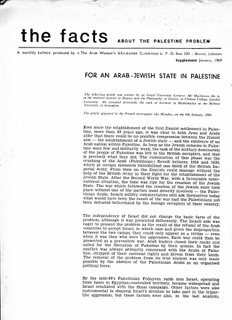 Zionist attitudes and Palestinian reality after the declaration of the State of Israel in 1948 and the war of June 1967. 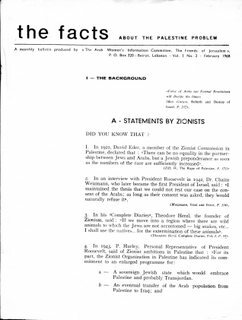 Statements by Zionists, from the late 19th century until the 1960s, where they declare their true intentions in Palestine. 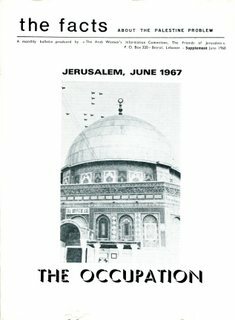 What was happening in Jerusalem during the first days of ‘The Setback’, from 5th to the 8th June 1967. Further statements by Zionist about their plans and intentions over the Palestinian homeland. 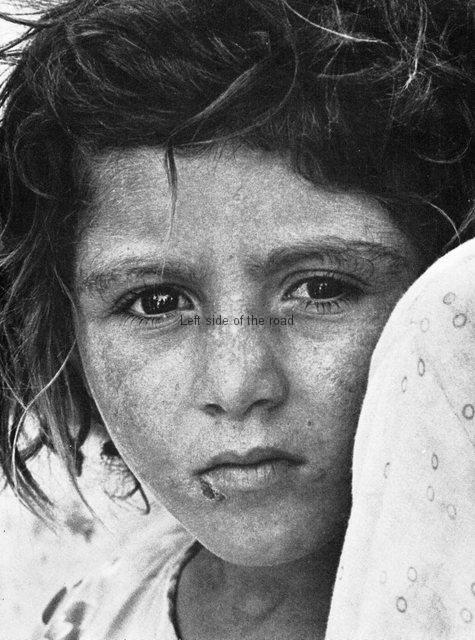 The argument for a state of Palestine that would be home for both Arabs and Jews. This first appeared in the French newspaper Le Monde on 9th January 1969. 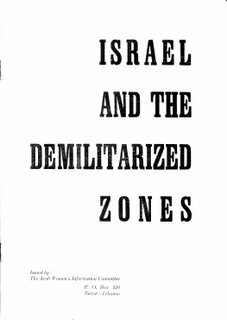 How Israel has been using the so-called ‘Demilitarized Zones’ as an extension of the Zionist State of Israel. 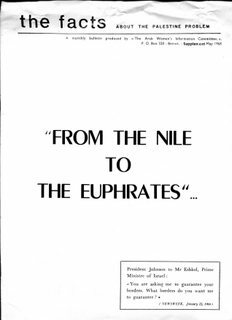 Statements from the 20th century where the Zionists have made it clear that their idea of the State of Israel extends from the Nile to the Euphrates. Tactics used by some Zionists in trying to convince Jews to leave their original homes and to migrate to Israel. 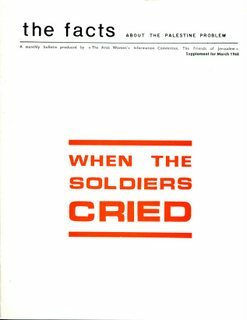 How the Israeli Defense Forces treated prisoners after the war of June 1967 – and a trend that has continued to the present day. The women of Palestine fight against the occupation in the Occupied Territories and abroad. 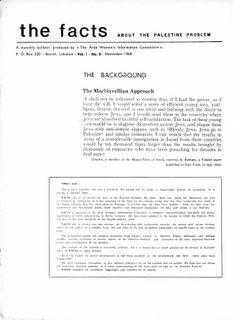 Includes statements by Zionists, over the decades, of their intentions for the ever greater expansion of the State of Israel. 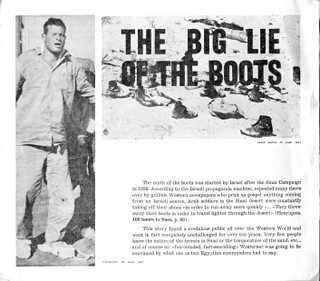 One of the more successful lies that the Israeli Settler State was able to peddle in the aftermath of the so-called ‘Six Day War’ of June 1967.